CAREER: Growing up in the Clifton Hill area of East Dry River, Port-of-Spain, Alexis had his first exposure to pan music when he began sneaking into the panyard of the Hill 60 Steelband at the young age of eight. 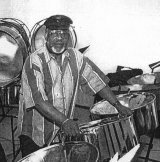 Later, he began hanging around the panyard of the Hit Paraders Steelband on Ana Street in Woodbrook, Port-of-Spain, where he had his first experience playing on the road during the 1952 Carnival. While with Hit Paraders, he would frequently spend time at the Invaders panyard. He then moved to the Tripoli Steelband in neighboring St. James. In the late-1950s, he was recruited for his first arranging experience by the Stereophonics Steelband and, later, by the Joyland Synco Steelband, both of East Dry River. 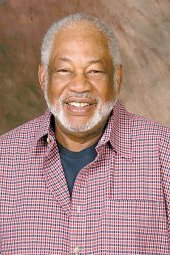 In 1964, he joined the National Steelband of Trinidad & Tobago which toured Africa, Europe, and the USA performing for luminaries such as Queen Elizabeth II, the Emperor of Ethiopia Haile Selassie, and President Senghor of Senegal. He left Trinidad for the USA in 1965 and played with the BWIA Sunjets from 1965 to 1967, returning home briefly for Carnival 1967 to play with Invaders in the Panorama competition. Later in 1967, he played at Expo '67 in Montreal, Canada. He then formed his own band, Cliff Alexis and the Trinidad Troubadours, and went on to make appearances with the famous American pianist Liberace. With the help of Liberace's agent, the Troubadours played in various state fairs and in Nevada (Las Vegas, Reno, Lake Tahoe) from 1967 to 1972. He moved to Minnesota in 1972 and spent the next 13 years teaching the art of the steelband to students at St. Paul Central High School in St. Paul. In 1985, he was hired by the Northern Illinois University (NIU) where he built a band and taught students to play pan. The NIU band eventually went on to perform around the world and Alexis became an ambassador for pan music. Alexis has appeared with several university ensembles and played and presented at Elgin Community College, the Birch Creek Music Center, the Singapore Festival of the Arts, and the National Institute of the Arts in Taiwan. In October 2000, Alexis' NIU steelband competed in the first World Steelband Festival in Trinidad and took second place.